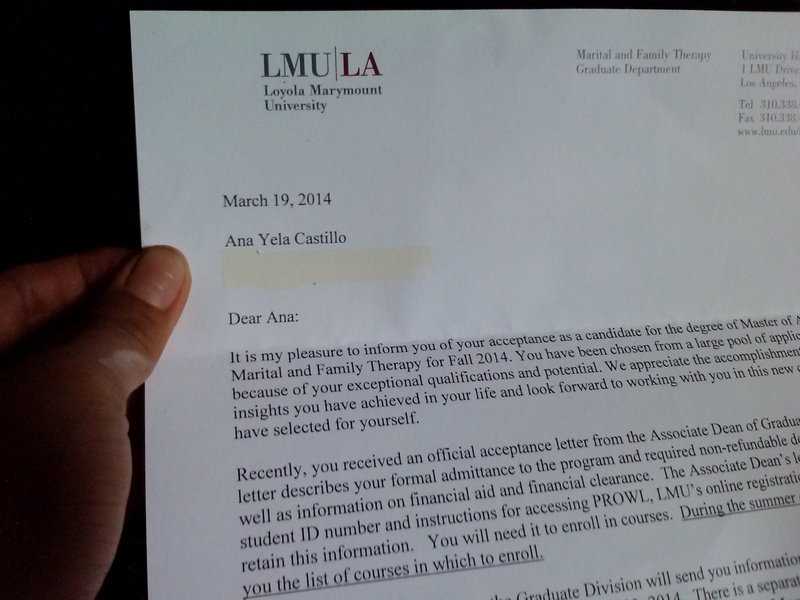 Just as I expected, I received my acceptance letter from LMU to begin my Masters Program as an Art Therapist. I knew it. For almost 3 years I worked on my pre-requisite coursework on a part time basis at Los Angeles City College. I worked very consistently to get the best grades possible. I wanted my transcript from LACC to have straight A’s. I almost succeeded … I messed up when I couldn’t finish my Spring semester bc of my father’s passing. When my father’s life came to a halt, so did my goals and plans for school. Everything stopped…for several months. I decided to continue pursuing my educational and career goals one day before the final class to complete my coursework began. And so I started up again 6 months after my father’s passing. Two part time jobs, one psychology class left, an entrance exam, and a 15 page autobiography were needed to complete my application for grad school. Everything was turned in! I met the deadline, checked every item off. I had a complete application and I knew I would get priority. Many students apply without having all the coursework completed. That’s because you need 12 units of Psych and 18 units of art coursework, this translates to 10 college classes. And so i waited. While waiting, several people asked me, “well what happens if I dont get it”. To which I always replied, “Nah, I’m getting in, I did all the work”. I think it was Gurri or someone who said, “So you are shooting with just one arrow and hitting the target”. YUP! Finally I had my interview. I prepared myself and walked in with a lot of confidence. I had more questions for the interviewer than he had for me. He told me they would only accept 19 people into the program. Yikes! But i still walked out of the interview owning it. I had been very intentional through and through. Going to ceremony and sweat lodge and always putting that prayer forward. I am so grateful for my spiritual community that has grounded me in so many ways. I am very grateful to the people who took the time to write me a letter of recommendation: Jeanne S., Camille A., and my art professor Robin Adsit. It was so hard to ask for a letter but it was my last opportunity to apply for grad school. This was it. Afterwards I continued to work on my autobiography. Again, I’m very thankful to my friends who went through each page and read my story. I know it was a lot to do for me, thank you for your feedback and encouragement: Maria Teresa, Maria R., Renaldo and Diana, Liliana, Sarita, Brenda Y., and Barnica. To Sonji, Vanessa, and Xaris, thank you for being patient with me, we had a beautiful wedding to plan and I needed a bit of time to jump into gear with you ladies. Also my partner Jose, who simply continued to support me, lending me his apartment so that I could finish my application without any distractions. 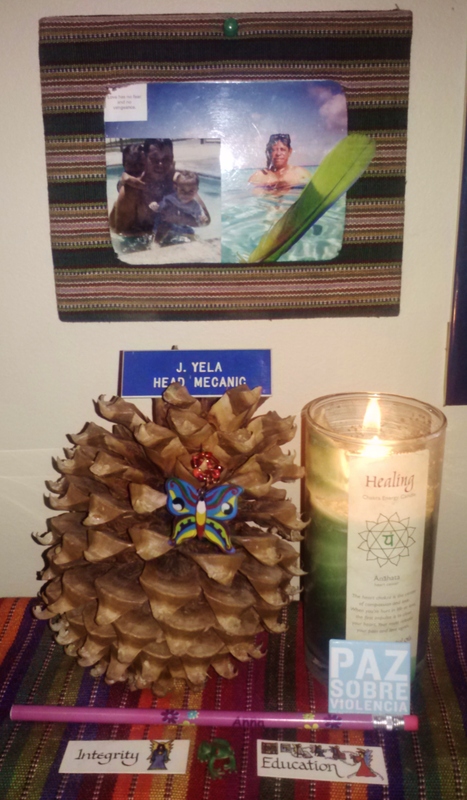 One more mention, when I was an undergraduate at UCSC, I participated in a program where peers and mentors supported me to have the courage to apply to graduate school. I wanted to keep my promise to myself and to the program that one day I would earn a graduate degree, it took almost 7 years to believe in this dream again, but it was always deep inside. Thank you to the FMP 2004/2005 cohort, to EOP, and my mentors Paul Ortiz, Rosie Cabrera, & Gloria Chacon for inspiring that dream. Oh my goodness, and if I have to go even farther back … There have been countless people that have supported my journey into higher education. Period. This brown womyn needed all the encouragement possible!!! To do the things that no one else had time to do, that no one else could do. Dependent on the need to express my complexities. And it’s this entangled reality that is scary to even formulate into words, to draw and exhibit, to dance and let go of. If I couldn’t write, if I couldn’t paint, if I didn’t dance, surely, I would cease to be. To exist in these ways is intimidating. But who am I to stop, all that must be generated. To be let free, the ancestors before me stretch the walls of my skin. They pound and they scratch, so I listen, carefully, to find a way to give them voice. To let their pain be heard, to let their struggle continue, to let their hopes live on. I acknowledge our inheritance and change what we make of it. To laugh to what we once cried about, to love when we were once bruised and humiliated. To birth when they ventured to extinguish us. And to rise when they expected to defeat us. Every thought conveyed to words, every brush stroke that is shaped, every step that I spin, it isn’t even me. I’m just a vessel of ancient wants and needs that are fighting to be. It isn’t me. It is everyone before me. Otherwise, I risk the dangers of our children, following a repentance that simply doesn’t belong | to them |anymore. This piece was inspired after reading “An Open Letter to Women Writers of Color”, by Gloria Anzaldua. Bt it was posted because i was told by my friend (who use to pick on me in middle school /who now follows my blog) , “you should at least write something once a month”. Done. I just finished watching this film. Its a good film and a sad story about Native children who were kidnapped and forced to live in boarding schools. The truth is still the truth. Enjoy your turkey all you want, but remember that part of what you may be thankful for, came at the cost of life and the sacrifice of others. it was good to see you. it was good to walk into your home and into my room. we would argue for the next 4 days about how I should wear shoes “y no Andes descalsa”… But honestly, my feet were perfectly happy walking on the cool, clean floors.